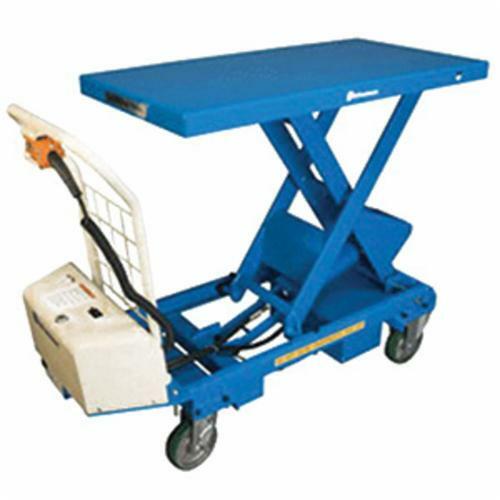 Lift Tables Provide Improved Ergonomics and Easy Mobility!! Bishamon® MobiLift™ Scissor Lift Tables minimize undesirable lifting, reaching and stretching to help increase productivity while decreasing workplace injuries. Designed to provide exceptional functionality and maneuverability whether loaded or empty, workers can easily move and position loads to a convenient working height when stocking shelves at retail locations or loading goods at manufacturing operations. Heavy-duty steel construction features a durable powder coat finish and captured scissor rollers for maximum stability. Rolls smoothly on 2 rigid and 2 swivel (with brakes) polyurethane casters. 1 Year Limited Warranty. Battery Powered MobiLift™ features a simple push-button control for safe and easy lifting. Control includes a coiled cord for remote operation and can be stored in the convenient mount on the handle. Standard features include On/Off switch with integrated circuit breaker, enclosed automatic battery charger with removable power cord, Green-Yellow-Red battery status indicator lights, upper travel limit switch and easily accessible adjustable lowering speed control.